The search for life beyond our planet is also the search for the most universal power source — water. Valentine’s Day, 1990: An unmanned space probe hurtled through the orbit of Pluto at 40,000 miles per hour. Voyager 1 was 12 years and 3.7 billion miles away from home. It was about to become the human-made object farthest from Earth. The mission control crew reportedly had prepared to turn the cameras off to save the batteries for the spacecraft’s long journey beyond the border of the solar system. Astronomer and writer Carl Sagan was among the scientists tracking the spacecraft, and he persuaded mission control to swing the camera around for one last glimpse homeward. That backward look was the first time the solar system had been seen from the outside. 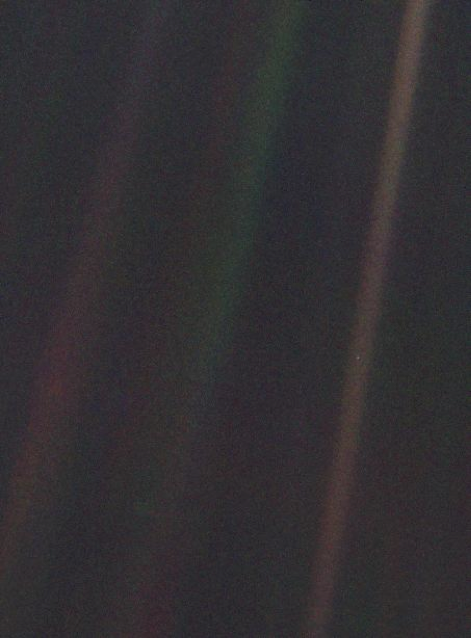 The camera snapped about 60 pictures, and in one of them, a humble point of blue light can barely be seen in the corner of a sunbeam: Earth. Among the many qualities that make this dot unique and precious is that which makes it blue: oceans, rivers, great lakes, inland seas – liquid water. Liquid water is an ideal medium for life, and our sloshing planet teems with it. We evolved in these waters, and they have become the paradigm for our search for life elsewhere in the universe. Space itself is full of water. In fact, it’s probably the most common molecule in the universe. But there’s a catch. Most of it’s going to be either water vapor or ice. Life needs liquid, and liquid water is hard to find. 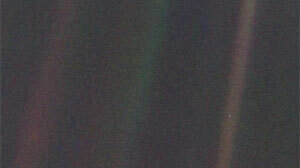 “If somebody observed the Earth from a great distance, they would see this pale blue dot. Let’s look for other pale blue dots that might look like the Earth,” says Andrew Pohorille, the director of astrobiology at NASA Ames Research Center in San Jose, Calif.
“It’s NASA’s idea of exploration: We should follow the water in the universe,” Pohorille says. In the solar system, our planet is happily situated in what astronomers call the “Goldilocks zone”: close enough to the sun where the water won’t freeze, but distant enough that it won’t boil off. Pluto’s too far away, Mercury’s too close, but Earth is just right. Not only is water essential to us, but also it’s the basis for the only life we know and the only life we’ve found so far. When they look for life beyond the solar system, astronomers search for other star systems with planets in the Goldilocks zone. “Finding planets that might be like the Earth…. Everybody can understand why that might be interesting,” Shostak says. In 2011, they found one. NASA’s Kepler Mission confirmed the first planet outside our solar system in the Goldilocks zone of a star not too different from our sun. It would take us 600 years, traveling at the speed of light, to reach this planet from Earth. For now, the possibility of liquid water has not been ruled out on Kepler 22b, “so that’s a step forward,” Shostak says. But we’re closer to finding liquid water than we’ve ever been before. Since finding this planet, the Kepler Mission has identified hundreds of candidates that might be “just right” for life. “In one or two years, you’re going to be hearing about all sorts of Goldilocks planets that might be like the Earth,” Shostak says. In the meantime, we’ve scoured the rocks of Mars and peeked under the heavy atmospheres of Saturn’s moons. So far, nothing has looked back. Sagan, Carl. “Pale Blue Dot: A Vision of the Human Future in Space.” Ballantine Books, New York: 1994.